A to Z Motor Spares (Wakefield). 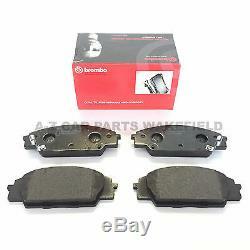 For Honda Civic EP3 2.0 Type-R Front Drilled Grooved Brembo Brake Discs Pads Kit. 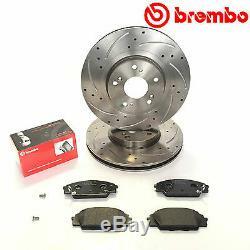 Honda Civic EP3 2.0 Type-R Front Brembo Drilled & Grooved Brake Discs And Pads Kit Brembo Front Drilled & Grooved Brake Discs + Pads (Front Axle Set) Axle: Front brake set up Brembo Discs Part no: 09.9544.10 (DRILLED AND GROOVED) Brembo Pads Part no: P28032 Front Disc Diameter: 300mm Front Disc Thickness: 22mm Brembo Premium Brake Discs For half a century premium car makers have recognized Brembo as a true leader in their highly specialised market segment. Components for high-end cars require a carefully customized technical approach and innovative solutions. That changes today with the launch of Brembo`s dedicated range of Aftermarket integral and composite brake discs (including floating discs). Brembo is now bringing its exclusive expertise as a supplier of top-of-the-range braking systems for the world's most prestigious cars to the design and manufacture of Aftermarket components for high-end cars. The new Aftermarket range features high performance technical innovations, including. Specific materials Dedicated venting solutions Customized machining of the braking surface. Thanks to these technical solutions, Brembo guarantees top performance even in extreme conditions, highly durable brake components and the best driving experience. The new Aftermarket range, which will be expanded over coming months, already covers top models of such important brands as Porsche, Mercedes-Benz, Audi, Aston Martin and other Drilled And Grooved Drilled & Grooved: The key benefits of the drilled discs are the drills dissipates heat more effectively and breaks down surface gases when braking at high speeds. The holes are laser drilled through the discs which reduces brake mass. The drilled discs also keep the brake temperatures rapidly low which helps keep the pad surface from reaching very high temperatures from the hot surface gasses. Brake Discs With Fastener Screws. Brembo includes a fastener screw kit in the same package as the disc in order to make the disc replacement easier, especially when the original screws are so rusty or consumed they cannot be re-used (at least not easily). Fastener screwâs purpose is simply to set the disc in the right position (hub-centered), making braking system maintenance easier. Some applications need no fastener screw, a lot of them need one, others need two or more. One screw is enough to fasten the disc. Some companies make two positioning holes to allow disc rotation from a position to another, but there is no need for two screws. 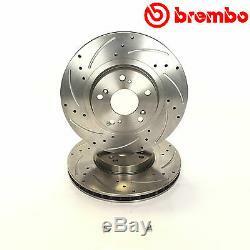 In case of applications with one hole, the mechanic can replace the screws of both the discs with Brembo new ones. In case of applications with two holes, the mechanic can replace the most rusty or consumed screws with Brembo two new ones, re-using the remaining ones. In the unlikely possibility of unusable screws, maintenance can be completed by only using the two screws in the kit. Brembo Brake Pads Brembo extensive range of brake pads and shoes are the result of years of experience and collaboration with the world's leading car makers. These pads are the perfect partner for Brembo discs for maximum braking safety and minimized stopping distances in all road conditions. BEFORE PURCHASING WE RECOMMEND CONTACTING US WITH YOUR REG NUMBER SO WE CAN CHECK FITMENT. THIS WILL AVOID ANY DISAPPOINTMENT OF RECIEVING INCORRECT PARTS. We make every effort to deliver goods within the estimated timescale. However delays are occasionally inevitable due to unforeseen circumstances. We recommend you do not book your vehicle in for any repairs until you physically have the part to save on any disappointment caused by delays. Azcarparts Wakefield will be under no liability for any costs on damages or expenses caused by any delays. The item "FOR HONDA CIVIC 2.0 TYPE R EP3 JDM FRONT PERFORMANCE BREMBO BRAKE DISCS PADS" is in sale since Wednesday, June 24, 2015. This item is in the category "Vehicle Parts & Accessories\Car Tuning & Styling\Performance Braking\Performance Brake Discs". The seller is "atozwakefield" and is located in Wakefield, GB. This item can be shipped worldwide.